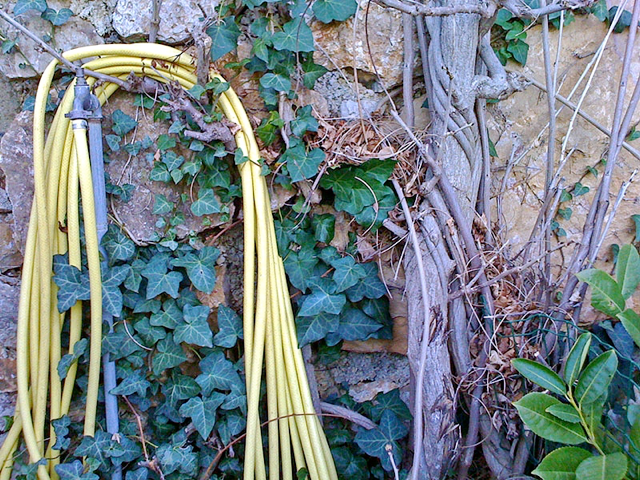 Every day, climbing the steps from the garage to the house, I pass this rolled up yellow hose. I’m quite sure it has not been used yet this year, what with all the rain we’ve been having, but the way things are going, it can’t be too long until it is uncoiled and put to work. I suppose I am so accustomed to having to move such items indoors during the winter months that seeing a hose in the same spot for 12 months strikes me as peculiar even after 18 years of living in the south of France. Incidentally, this hose is connected to a community faucet; it should only be used to water the common areas. No one has to have their private water bill impacted for taking care of what everyone is enjoying. I’m happy to report that the system is not being abused.